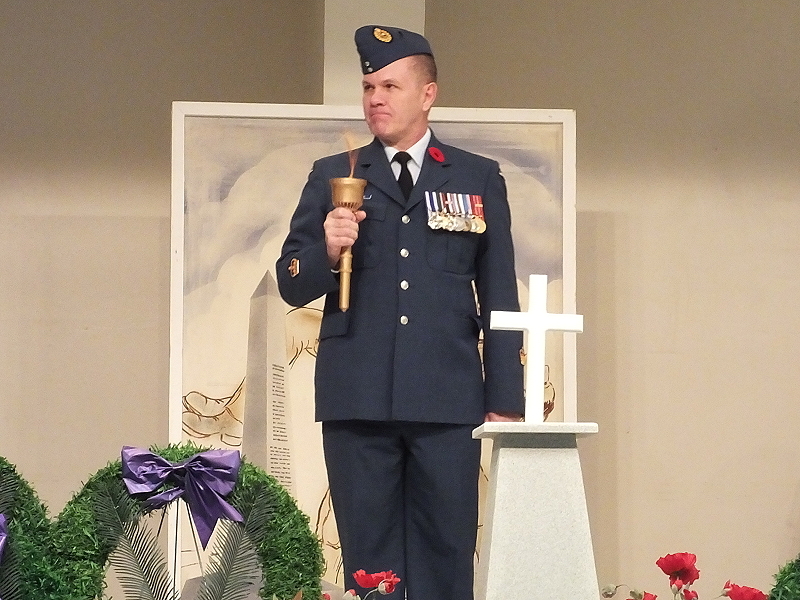 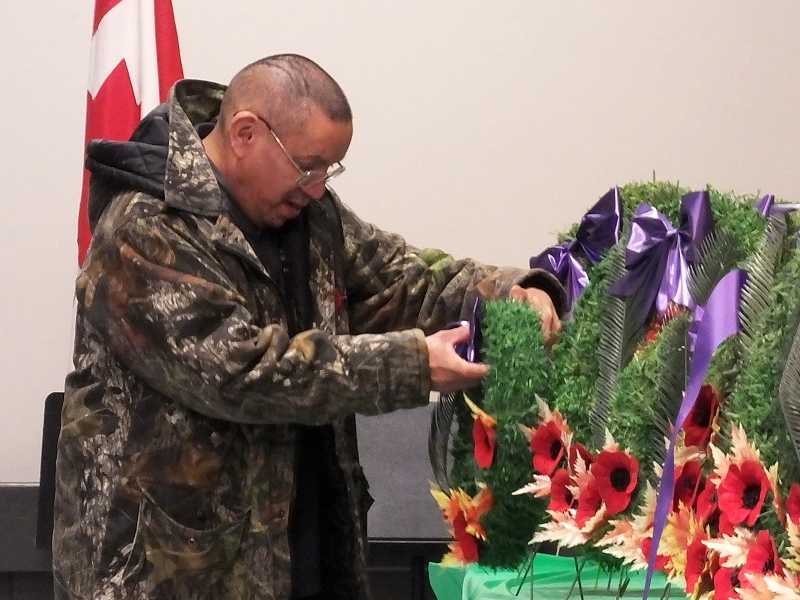 Taking up the torch was the theme of the Remembrance Day service in Swan River on November 11, 2018. 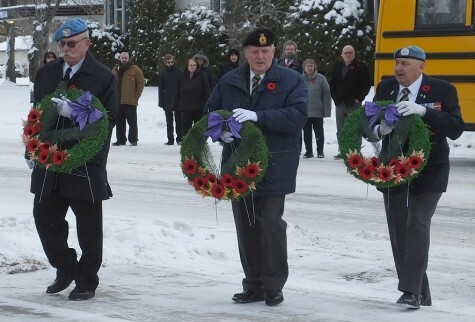 The day of remembrance began with a march to the cenotaph in Swan River and the laying of three wreaths in honour of the Air Force, Navy and Army. During the service, wreaths were laid by Veterans, organizations and community members in remembrance of those who took up the torch. Pastor Lewis recounted his recent trip with Royal Canadian Air Cadets Squadron number 519 as they toured important WWI and WWII sites in Germany, Netherlands, Belgium and France. 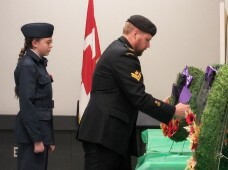 The visit to Vimy Ridge on a cold and misty day had a profound impact on Lewis. “Our memorial on Vimy Ridge expresses a range of emotions and hope, but the overall effect is that the beauty of human courage, compassion and even grief will overcome the ugliness of violence, terror and war.” he said. To begin the Torch Ceremony, Ronaele Greig picked up the torch on behalf of her Uncle Ira Staples and her Father Harold Staples who served in World War I. 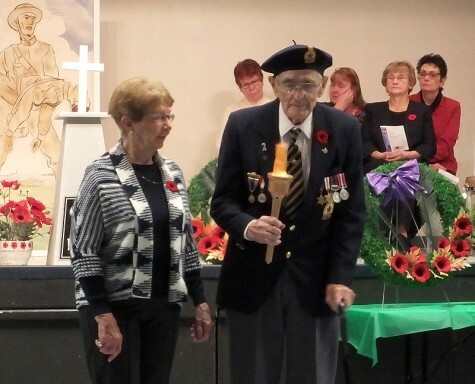 The torch was passed to World War II Veteran Keith Fulford, then from one hand to the next of those who have faithfully taken up the torch in service. The torch came to rest in the hands of Warrant Officer Shaun Delamere, representing the current generation of serving Canadian men and women. 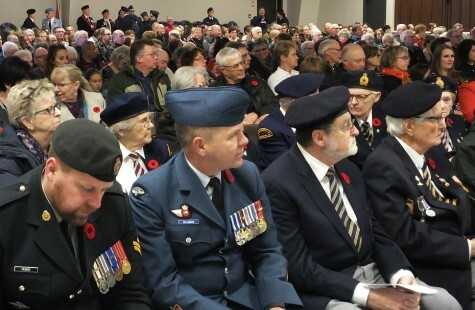 The ceremony spanned wars, countries and generations; World War I – World War II – Korea – the Cold War – peace keeping missions, war within nations, war with neighbors – Afghanistan and recently, Operation Reassurance in Latvia.